Don’t Shoot! The 3 Times NOT to Make a Video | Rewatchable, Inc.
We make business video all day every day. We love business video, and business video production. When we get home at night, we bore our families by talking about business videos. You’d assume there’s NEVER a time we’d recommend stepping back and not pressing the record button, right? Wrong. Here are three times we’d suggest you should never, ever step in front of the camera. There are plenty of times and places to tough it out. In front of the camera is not one of them. When you’re on video, you represent your brand, and your brand is strong. If you don’t feel good, you won’t look good, and you almost certainly will not represent your brand well. Got a cold? Postpone your video production. Flu? Postpone. Fever? Postpone. Blemish, cut yourself shaving, cold sore? Call a pro, we have software for that. Don’t get us wrong – you’re an expert – a walking, talking fountain of knowledge. Except things change. People change positions. Products get refreshed. Services get added. Versions get updated. And unfortunately, in those moments of change, and in spite of how awesome you are, you might not quite know entirely what you’re talking about. If it’s time to make a video, and you can’t take a deep breath and say ‘I know this inside and out?’ Postpone the video production. You can’t get good sound. In the age of YouTube, viewers will forgive a less-than-perfect video. What they won’t tolerate is inaudible, or annoying, audio. There’s nothing worse than seeing great content with unacceptable sound. 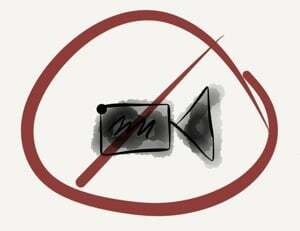 That GoPro looks great, your Flip looks fine, and your iPhone looks darn near professional in the right light, but if you’re going to use an amateur camera for business video, do yourself a favor and stack the deck in your favor by recording in a VERY quiet environment. If you can’t control your environment, and you don’t have a good mic, stop the show. Reschedule, and do it again when you can capture acceptable audio. You’ll be happier in the long run.